Features 3 pockets for storage: 2 front patch pockets and 1 outer pocket on the left. For added style, this scrub top includes reverse cover-stitch details, a curved hemline, and a heat transfer logo on the left sleeve. 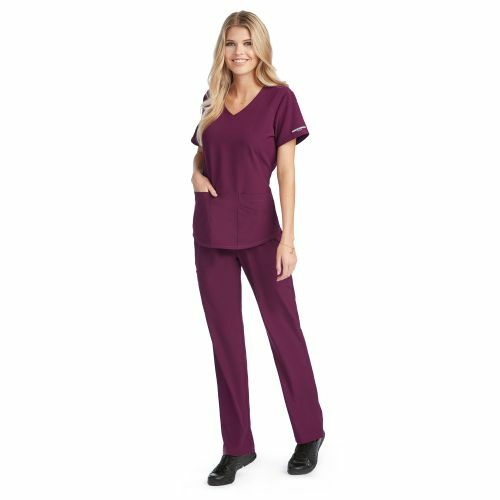 The Skechers SK101 Vitality V-Neck Scrub Top features 3 pockets for storage: 2 front patch pockets and 1 outer pocket on the left. For added style, this scrub top includes reverse cover-stitch details, a curved hemline, and a heat transfer logo on the left sleeve. 3 pockets for storage: 2 front patch pockets and 1 outer pocket on the left. Approximate length for medium: 27.5".